Over the past years we had basically three wedding celebrations. First one was about two years ago and was a civil marriage/ civil ceremony in Finland at our local register office. This was just a small happening with two of our friends to witness it and we went out eating together. We kept it small as we had great plans for the following summer! Last year then, one year after our civil marriage, it was time for the real ceremonies, one in China and one in Finland. 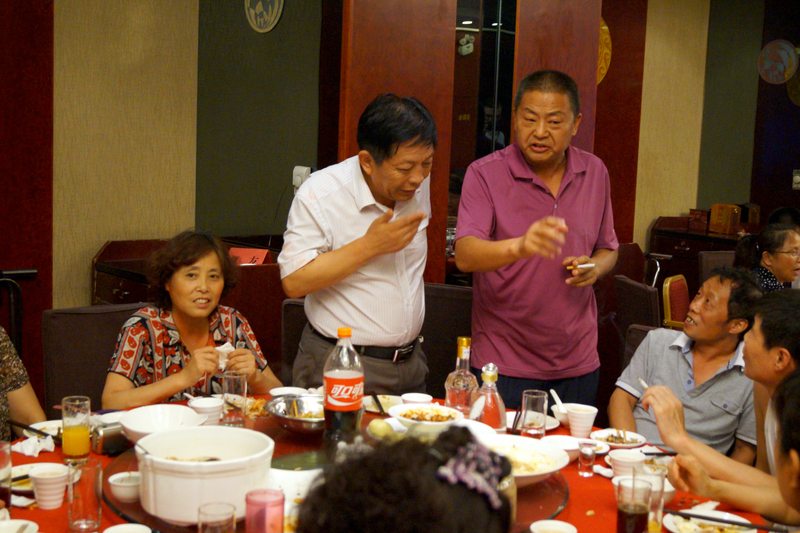 The ceremony we had in China was actually called a “Thank you gathering” 答谢会 and was planned by my parents-in-law. I still remember that in the beginning it was to be a dinner with only the family in a nice restaurant. 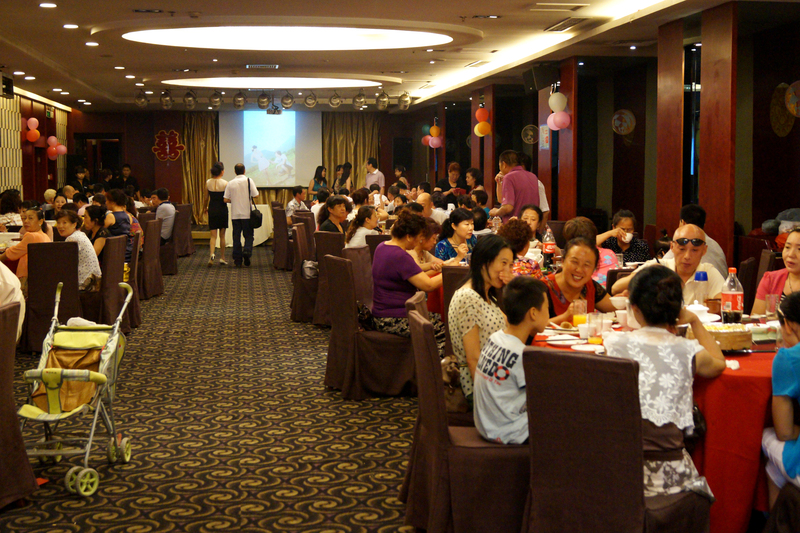 From there it evolved into a bigger dinner with family and a few family friends into a dinner with 100 guests. Don’t ask me how it developed like that as I had nothing to do with organizing it and had not even any idea at all about the size of this event till a month before it. The location was in a hotel somewhere in Xi’an. I say somewhere in Xi’an, because I have absolutely no clue at all about anything what was going on, well, parents-in-law were organizing it and my role was to be there, smile, say a few thank you words and try to survive the baijiu 白酒. It was especially interesting to see how there were several men waiting outside in the blazing sun for over half hour. When I asked my wife about it she had no idea what was going on until she asked her father. apparently these men were all waiting for the current boss of my father-in-law to arrive so they can greet her and guide her to the restaurant. Looking at them I felt very glad to be inside to enjoy the benefits an AC. 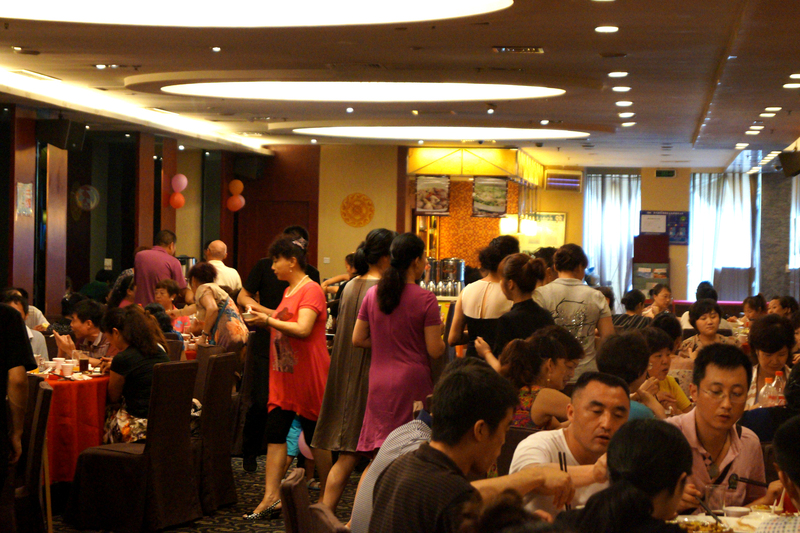 Even though it was not a real wedding ceremony we had ten tables packed with people, too much food, drinks and cigarettes and of course a MC. This MC was the retired boss of my father-in-law and was doing, at least in my opinion, a very good job. Of course I had to say some things also on stage by repeating words and phrases the MC told me in front of everyone. Sure enough I gave the people something to laugh about and to this day I still don’t know what I said wrong. After this part was done the food started and both of us had to go to each table, thanking the guests for coming. 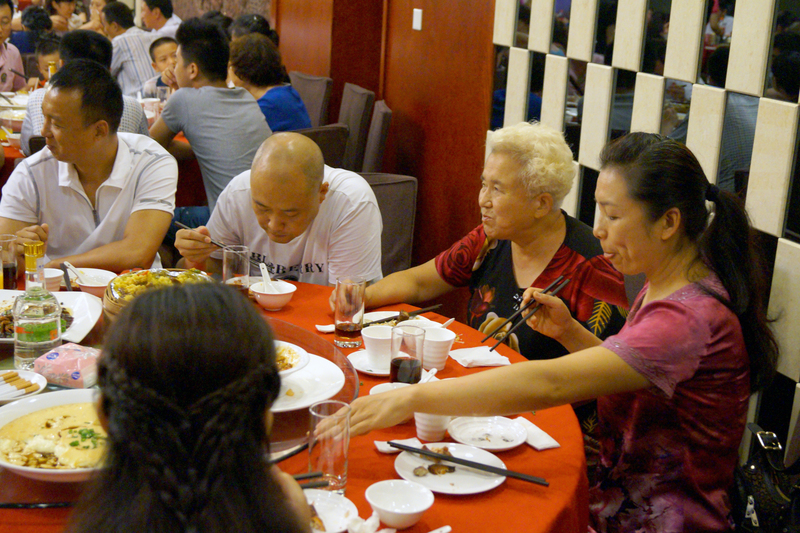 Now this usually means that at least the husband has to drink at least one glass of beer or a shot of some baijiu with the people on each table but surprisingly I was given always tea, cola or other soft drinks. Okay, not always as there was the one table with the godmother and godfather of my wife which was at the same time the headquarter of the infamous booze-brothers. The friendly godmother gave me all kinds of things I had to eat at that table and the booze-brothers (godfather belongs to that crew) tried to fill me up with beer, baijiu and smokes. In the end we managed to escape from that table and shortly after the dinner ended rather quickly. Even though there was so much food we barely ate anything as we had our duty of visiting each table and by the time we were done the food was finished (well, the untasty leftovers were still everywhere but I prefer to have a proper meal). I think the whole thing was other in less than three hours but these hours were surely exhausting! Looking back my parents-in-law did a pretty good job with it but I am happy that is over as it was pretty stressful. How is you experience with weddings, perhaps even a wedding in China?